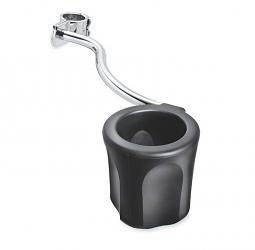 Shaped to blend with the contours of your Harley-Davidson® motorcycle, this unique cup holder is easy to reach without cluttering the handlebar. 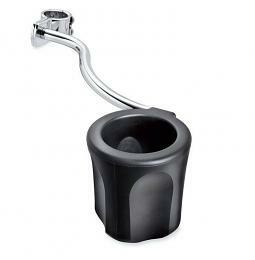 The attractive chrome mount securely attaches to the frame downtube and sweeps rearward to support the cup holder. The soft-touch insulated holder flexes to grip the beverage and features a perforated bottom to drain away rain water. Kit includes model-specific clamp, support rod, cup holder and all required mounting hardware. Harley-Davidson®.